The 4th of July is Independence Day for the United States. Before becoming a country, the U.S. was a group of colonies owned by Great Britain. On July 4th, 1776, the founding fathers signed the Declaration of Independence and announced their independence from Great Britain. The 4th of July is now an important holiday in the United States. Americans celebrate by participating in parades and going to events and concerts where patriotic songs, such as “America the Beautiful” and “This Land is Your Land,” are played. At night many people gather in parks to watch fireworks, displays of colorful lights exploding in the sky. The Library of Congress: “America the Beautiful"
Americans also enjoy the 4th of July by having barbecues or picnics with their family and friends at home or at a local park. They grill hot dogs, hamburgers, and other meats or vegetables. They eat potato salad, corn on the cob, baked beans, watermelon, and a variety of desserts. Since the 4th of July is during a school break, Americans often take a vacation during this national celebration. Families travel to many places in the U.S. to visit national parks, the mountains, beaches, and large cities. They go camping, visit theme parks, and stop at important national historic sites. Many people also visit Washington D.C., the nation's capital, to celebrate the 4th of July. This holiday is an American favorite because it is a fun birthday celebration of the United States. Does your country celebrate its Independence Day or a similar national holiday? How do you celebrate on this day? Are there any songs which are important to your country? Why are these songs important? Can you find your national song on the Internet? If so, add a link to it. 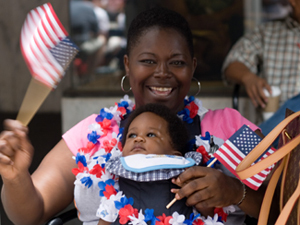 Have your students listen to the article “Americans Reflect on Meaning of Independence Day”. While listening, ask your students to write down 2 reasons that Americans think the 4th of July is important and 2 symbols and historical events that are related to the 4th of July. After listening, have students share their findings with the class. Next, have students write down the meaning of the Independence Day or national birthday of your country. Ask them to write down two national symbols of historic events that are important in your country, and then share them with the class. Next, give students a copy of the sheet music for the song “America the Beautiful.” Then play the song for the class and have students follow along with the music while listening to the song. When the song is over, have students write lyrics about their own country to the tune of “America the Beautiful.” Encourage students to be creative and to use words for lyrics which reflect the beauty of their own country. If necessary, provide the musical score for the song to students. The same activity can be done without using the tune to "America the Beautiful." Students can write the words for a song about the beauty of the country without a tune or with a different tune. After students have written the words for their songs, ask them to volunteer to sing or read their new songs.